This pendant has a Black background with two pieces of Gold patterned Dichroic glass on top. There are earrings to match. It measures 3cm x 3cm approx. and is made of two layers of glass. 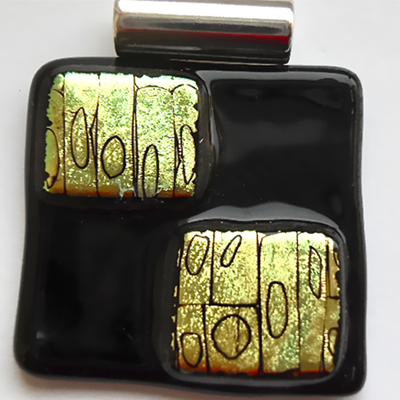 A Black base layer with two large pieces of Gold patterned Dichroic glass fused together. There are matching square stud earrings.